"He walked on steadily, and the black patches returned, took on strength and depth, became the houses of a small town. Joško wondered why there were no lights on anywhere. It wasn't possible for everyone in the town already to be asleep — sunset hadn’t been so long ago. Then again, time was no longer what it had been. Before, it splintered easily into hours and minutes, but now it was a dense vastness around him, contracting and expanding erratically, the heart of a dying giant." "A beautiful, powerful book: mythic, vivid, heart-rending. Kesey reminds us anew of how much power there is in an open heart and the simple declarative sentence. He also reminds us that war is a viral madness, infecting everyone it touches." "Nothing in the World is a mesmerizing tale of expulsion and return: this is as much a trance as a story. Here's the Serbo-Croatian War as you've never seen it, its starkness and brutality balanced by the harrowing beauty of its landscapes. Roy Kesey is a fearless and very welcome new writer." "Roy Kesey's Nothing in the World is as horrific and convincing as a nightmare. At its best it resembles the fever visions of Cormac McCarthy's Child of God or Denis Johnson's Jesus' Son. In telling the story of one young man caught up in the disintegration of Yugoslavia, Kesey has written a story that pushes us beyond war and strife. Instead, we are taken on a morally shattering forced march to the limits of human endurance itself. It is beautiful, brave, and I will not soon forget it." "In haunting, evocative prose, Roy Kesey captures the horrors of war, the insanity of genocide, as well as the fleeting joys of love. Nothing in the World is a memorable debut." "Roy Kesey is a natural story-teller, like the other Kesey, but writes about a wider world. This journey from an idyllic Croatian island life into the landscape of war is reminiscent of Cormac McCarthy’s Blood Meridian—everything is taken away, and all that is terrifying is beautiful—but Kesey’s writing also has the moral and figurative power of fairly tale. Nothing In The World will surprise you by how big it is." "Kesey has created a quietly brilliant protest against war, an exquisitely rendered tale in the absurdist spirit of such classics as Slaughterhouse-Five and Catch-22." 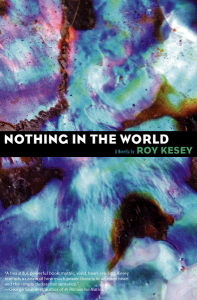 "I'm still buzzing from Roy Kesey's prize-winning novella, Nothing in the World. In the past couple of years I've read a number of his stories, and I'm always impressed at how he can inhabit fictional worlds that appear to be far from his own experience." "Kesey’s novella astounds as he portrays Josko’s nightmarish journey efficiently, effectively and engrossingly. (...) It’s amazing how much Kesey manages to tell in such a short amount of time. He writes with a sense of urgency that matches Josko’s, keeping the story moving along at breakneck speed." "It's a lovely, strange, kinda haunting little book." "Kesey's written a great debut book here, one that's as beautiful as it is brutal. Not to be missed." "Reading these 116 pages of prose — not a word out of place and no filler, no fat — makes you realize how padded with fluff most full-length books really are." "Kesey’s protagonist Joško is richly drawn and fully realized, as is the world he moves through." "Those who are familiar with Roy Kesey's writing, either through his dispatches from China at the McSweeney's website or the scores of stories he's published in magazines and anthologies, know that he is capable of linguistic high-wire acts and flights of thematic fancy that would make Thomas Pynchon blanch. Kesey is a proven stylist, and reading him can be like watching someone who's dedicated himself to mastering the art of the house of cards—the construction grows larger, taller, more improbably complex and precarious, and those observing hold their breath, certain that at any moment the whole thing will come down. But somehow, it never does." "It’s gruesome and harrowing and funny and sad, and you should get yourself a copy right freaking now."